A DUT (data unit type) describes a user-specific data type. Select a folder in the Solution Explorer in the PLC project tree. The dialog Add DUT opens. 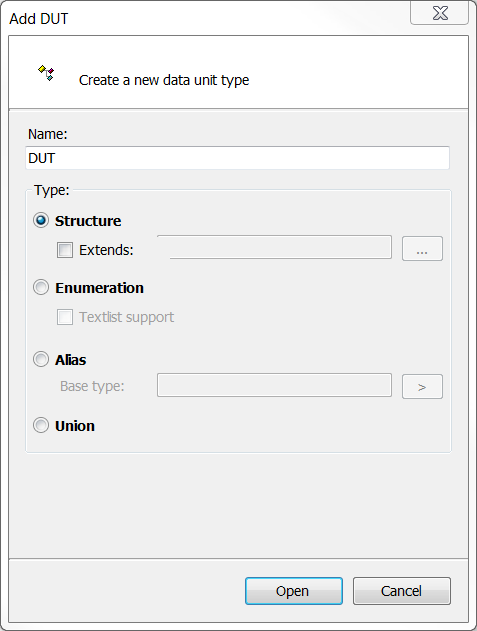 Enter a name and select a data type. The DUT is added to the PLC project tree and opens in the editor. The DUT consists of a structure of different data types. Extended: The structure extends an existing structure. The definitions of the extended DUT are therefore automatically valid in the new one. The DUT consists of a series of integer constants. Textlist support : Textlist support enables localization of the enumeration components. In addition, the symbolic enumeration values (instead of the numerical values) are displayed in the text output of a visualization element. When a textlist-supported enumeration variable is entered in the Text variable property of a visualization element, the supplement <enumeration name> is added. Example: The variable MAIN.eVar of type E_myEnum is used. E_myEnum is a text list-supported DUT. The entry in the properties editor then looks as follows: MAIN.eVar <E_myEnum>. If the enumeration name is changed in the PLC project, a prompt appears with the question whether TwinCAT should update the affected visualizations accordingly. Textlist support can be added to or removed from an existing enumeration object at any time: The commands Add text list support or Remove text list support in the context menu of the object can be used for this purpose. Definition of an alias for a pre-defined type. You can enter the pre-defined type directly or select it via the input assistant or the array wizard. With this data type, all components take up the same memory space. The memory footprint of a union is determined by the memory footprint of its “largest” component. The component declaration depends on the selected type (e.g. structure or enumeration). The following section shows two DUTs, which define the structures ST_Struct1 and ST_Struct2. The structure ST_Struct2 extends the structure ST_Struct1, which means that ST_Struct2.nVar1 can be used to access the variable anVar1.